2008 turned out to be the Year of the Veteran for USA Olympic table tennis. 38 year old Gao Jun and 34 year old Wang Chen directly qualified for the 2008 Beijing Olympic Games on the women's side. And on the men's side, 45 year old David Zhuang won the right to attend the Olympic Games as the USA' sole male representative. Oh yes, there was one youngster on the USA Women's Olympic Team. Crystal Huang, a youthful 29 in comparison, earned the right to play in her first Olympic Games by winning the North American Olympic Trials. Table tennis is truly a sport for all ages, and while you may not make an Olympic team in your forties, it's never too late to get started. And although most elite table tennis players peak in their twenties, the rest of us can often keep improving our training, tactics, and techniques into our sixties and beyond! The articles below will help you get started in ping-pong the right way. The history of Olympic table tennis is considerably younger than some of the ping-pong players who will be competing in Beijing. 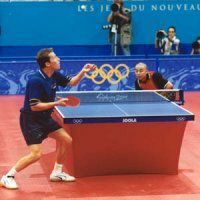 Table tennis first became an Olympic sport in 1988, in Seoul, Korea, and there are three athletes who played in their sixth Olympics - Sweden's Jörgen Persson, Croatia's Zoran Primorac, and Belgium's Jean-Michel Saive ! 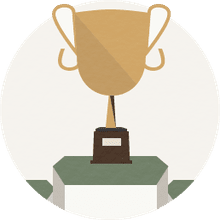 While many players had to compete in qualifying tournaments to make the Olympics, some lucky players had already earned their place! Well, in truth it's more due to skill than luck, since these players are at the top of the ITTF's World Ranking list - the only proviso being that only two players are available for direct selection from each country. While no USA men had directly qualified, in the women's event Gao Jun and Wang Chen qualified in positions 13 and 17 respectively. Congratulations ladies! Is Ping-Pong or Table Tennis the Proper Name for the Game?